We've done all 118 - but our job's not finished. Now we're updating all the videos with new stories, better samples and bigger experiments. 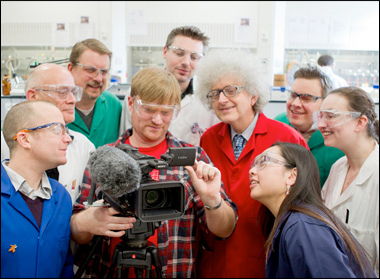 Plus we're making films about other areas of chemistry, latest news and occasional adventures away from the lab. All these videos are created by video journalist Brady Haran, featuring real working chemists from the University of Nottingham. More features and information about The Periodic Table of Videos can be found at our features page. Brady also works on Numberphile. Check out the website or YouTube channel.